Many of our customers require their cladding to be fire retardant treated to comply with Building Regulations or in accordance with architect's specifications. At Bennetts Timber we are able to provide two types of fire retardant treatment to cladding using either Non-Com Exterior or HR Prof and full details of both are shown on the website. 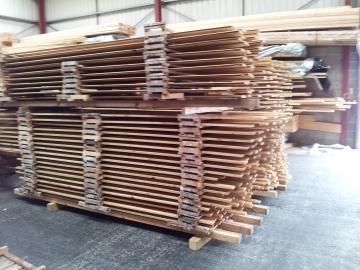 This photo shows Siberian Larch cladding drying in our warehouse facility after treatment with H R Prof and before delivery to the customer's site.